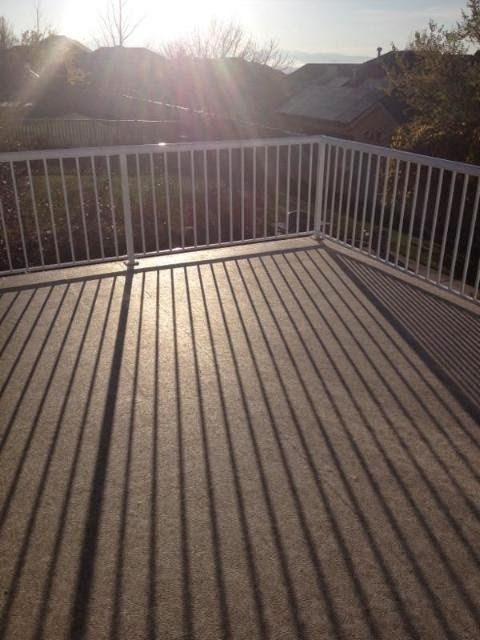 This home owner like so many others was simply frustrated and upset that their “waterproof”deck was failing. It was a concrete surface that had a nice pattern and looked great. So what happened to it and why do they have to spend so much money to repair it now? We will try to answer these common questions. Concrete is a very durable product and has many uses but it is not waterproof itself. In order to make it shed water a sealer or top coat needs to be applied to it on a regularly scheduled basis. These sealers are applied to the top of the finished surface or the pedestrian surface. The more you use the deck the quicker you will wear off the sealer thus needing to have it reapplied. Often the warranty is tied to the owner ensuring they have had the installer re-apply the sealer as required. But “they” didn’t tell me that! The simple truth is you need to do some work investigating the product, the history and the companies that are involved. Are they a local company? Have you been to their office? Exactly who will stand behind the product and the installation? A contractor has to agree to warranty their installation / labor for a minimum of one year here in Utah, this will vary by state. So what if you have questions after that time frame? I can only speak of our networks experiences, we want to hear from our customers regardless who the installer was after one year, five, ten or twenty. Its simple, at Duradek we care.